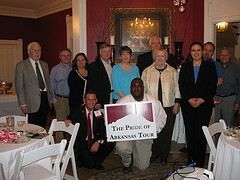 The Arkansas Alumni Association gave away more than $1 million this academic year to promising scholars. The association marked this milestone with an event at the Janelle Y. Hembree Alumni House on Nov. 7, celebrating the scholars, staff and volunteers that helped to reach the $1 million milestone. More than 100 scholars, Alumni Association staff and volunteers gathered for the event that included ice cream, drinks and light hors d’oeuvres. Houndstooth Clothing Company sponsored T-shirts with the “1 Year, $1 Million” logo. Scholars, staff and volunteers took the opportunity to meet and greet each other before listening to guest speakers: Robin January, scholarship coordinator for the Arkansas Alumni Association; Jack King, scholarship program volunteer; and Megan Wood, 2013-2014 endowed scholar. Starting with two scholarships, the committee for the scholarship review received an estimated 200 applications. “We had 198 people that didn’t get a scholarship, so we were constantly looking for what we could do to fix that,” Macechko said. In an effort to provide more scholarships to students, the Hogs Tags program was born in 1994. The program is dedicated to selling license plates with red, running Razorbacks for $35. Ten dollars goes to the state for administrative costs and $25 goes to the Alumni Association’s “Roads” Scholarship program. Today, with more than 26,000 Hog Tags license plates sold, the “Roads” Scholarship has supported more than 1,300 scholarships for scholars on their road to academic success. Davila is a volunteer for UATV and currently is the social media coordinator intern for the College of Engineering. Graham Stewart, executive director of the Arkansas Alumni Association, said, “It’s really exciting to be hitting that $1 million mark; there aren’t a lot of associations that can talk about helping students the way we have.” Stewart said the focus of alumni associations tends to be on alumni and not future alumni. In a press release, January said she’s been overseeing the program for a decade now. “Since that time, our total dollars awarded has increased by 550 percent and our average scholarship award has more than doubled,” January said. January attributes the success of the program to the Hogs Tags program and the more than 25,000 people who purchase a Hogs license plate, alumni chapters and societies across the country, and generous donors. Similarly, several scholarship recipients attribute their ability to attend the U of A and their academic success to the scholarship programs. Computer science major Adrian Ordorica is one of those students. Ordorica is part of the Student Alumni Association and said he plans to be part of the Alumni Association when he graduates. “Seeing as how I don’t have any money, I don’t have to worry about finances as much. It is still challenging because I have to find money each year,” Ordorica said. “I taught mathematics at the high school level to prepare young people to think and solve problems in the classroom, and to hopefully succeed at their work and life endeavors,” King said.